Dishoom’s new list of non-alcoholic ‘copy tipples’ (looks like alcohol, but does not contain one single drop), created by Carl Brown, taste like the real thing. 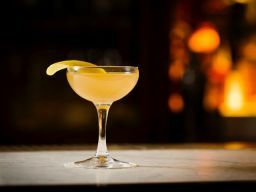 The Sober Martini (up) is a blend of juniper, ginger and gentian root in grape and cucumber waters, which gives a gin-like bitterness and warmth. Merchants Tavern in Shoreditch has plenty of deceptively saintly sharpeners on the menu such as the Garden Groove, a cocktail that combines beetroot & ginger juice, lemon, agave, and lemonade with Seedlip. Boozeless ‘Rickies’ at 45 Jermyn St. are a crafted range of homemade syrups mixed with house blend acid and highly carbonated house soda. Try the No. 9, a blend of Countess Grey cordial, acid and soda. For more inspiration, head to Dandelyan for The Bradsell, Seymour’s Parlour at the Zetter Townhouse Marylebone to try The Persian Merchant or to Grain Store for The Roman Redhead.